Richard Pollock's interest in motorcycles became serious in 1969, when he bought his first real bike, a Honda CL72 scrambler. Two years later, he began racing motocross on a used CZ. "I was unable to leave any bike alone," he says. "I'd begin cutting and carving them up almost immediately upon their arrival in my garage." 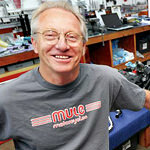 Today, Pollock runs Mule Motorcycles and is one of the most respected custom motorcycle builders in the USA. He's the go-to guy for street trackers especially, and his builds have been featured in Cycle World magazine more than once.